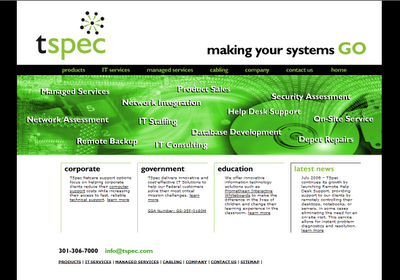 Julie & Company has just finished up a website for a long-time client, Technical Specialties, otherwise known as TSpec. The good folks there have been good to us for years; we first started working with them in 2001 when we rebranded and renamed the company. Unfortunately, I don't have a copy of the original logo, but as I remember it was pretty lame. Everyone was happy with the updated logo and website when it debuted seven years ago. Fast forward to 2008. A lot has happened since then - especially on the web. What was an innovative site in 2001 now looked, well, nearly ridiculous. It was difficult to navigate, impossible to optimize for search engines, and was just plain old worn out. So Patrick Carter, TSpec VP, called me to the rescue again. We've just launched the revised site and once again, everyone is happy with the face lift. We kept the logo as it is because it still looks fresh; this also allowed the company to avoid reprinting everything in its marketing arsenel. But Julie & Company greatly updated the homepage, adding a Flash animation, rollovers, and pop-up navigation. 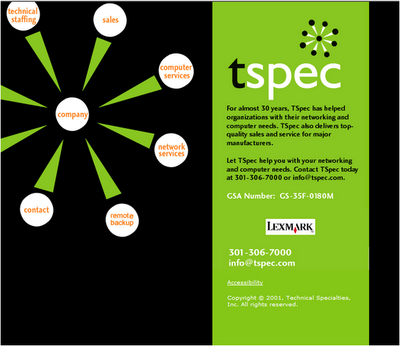 We also created sections for TSpec's major markets, allowing the company to provide a targeted message to a targeted audience. AFTER All's well that ends well - for now anyway. It's likely that within a decade TSpec will be hiring Julie & Company for another new website design. Why? Because the web will have continued to evolve and grow, and what looks great today will again look obsolete. However, if we're lucky, both Patrick and I will have won the lottery, paid off all our bills, and be living like royalty someplace warm. From my lips to God's ears! Until that time, thank you, TSpec for being such a great and loyal client.